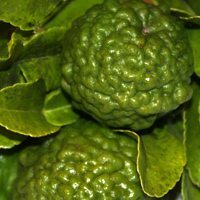 The Kaffir Lime tree is a fairly easy plant to grow and they are grown for the leaves as well as the fragrant fruit. Both are used widely in Asian cuisines, the trees themselves are easy to grow, they do not require much the care and same conditions as other citrus trees. Although both the leaves and fruit are both used in cooking, the fruit is not a juicy type, it is the peel,that is grafted and used, rather then the juice itself. (see picture right) The fruit is used in curry pastes and stews, the leaves are used in salads, soups, stews and curries. Kaffir Lime trees are readily available for sale from online suppliers and retail nurseries. Like most citrus trees Kaffir Limes like a sunny position in a well drained soil. they can be grown in pots and containers and once established are a reasonably tough tree. The leaves are what the Kaffir Lime is valued for, very fragrant and used widely in Indonesian and Malaysian cooking. Try growing Kaffir Lime Trees in a pot, they will reach nearly 2m, however if you keep picking the leaves for cooking they will stay a lot smaller. In the garden they can get to 4m. A frost free position is best, a regular citrus fertiliser will be sufficient and keep moist but not wet. Fruiting period – Commences in autumn. Fertiliser – use a specialist citrus tree fertiliser 2 – 3 times a year. Mulch around the plant to suppress weeds and retain some moisture. Once established these trees require little care or pruning other than to keep in shape or maintain a smaller size. Take care when transplanting or cultivating around the root zone as they do not like to have the root system disturbed. Ant shoots from below the graft should be pruned away. Mulch to retain moisture taking care not to build up mulch to close to the trunk of the tree itself as this can cause disease and collar rot. Water every week in dry spells. In pots water more often. A complete citrus fertiliser will be sufficient, applied as per instructions in early spring and again in autumn.